Male Peacock Tail Feathers provide spectacular beauty with their vibrant iridescent light catching tail feathers. This is what makes them a favorite for floral design, home décor, jewelry and so much more! Rather than pigmentation, peacock feathers' bright colors are produced by tiny intricate crystalline structures. Slight variations in the spacing of these microscopic structures cause different wavelengths of light to be filtered and reflected, creating the brilliant iridescent effect. Male peacocks shed and re-grow tail feathers each year during a process known as molting. The feathers are then collected, washed and sorted by size. 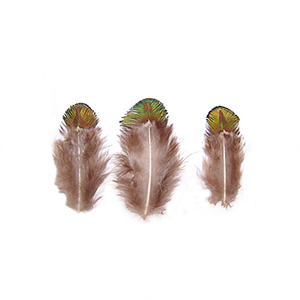 Because peacocks are wild birds and not raised for food, peacock feathers are a 100% cruelty free and renewable resource! 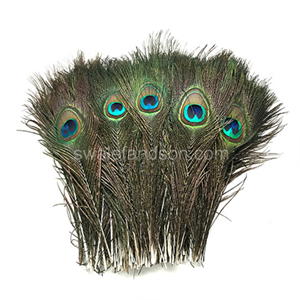 We offer Wholesale Peacock Feathers in a selection of natural and dyed colors, sizes and styles. Click on the images above to see what’s in stock!